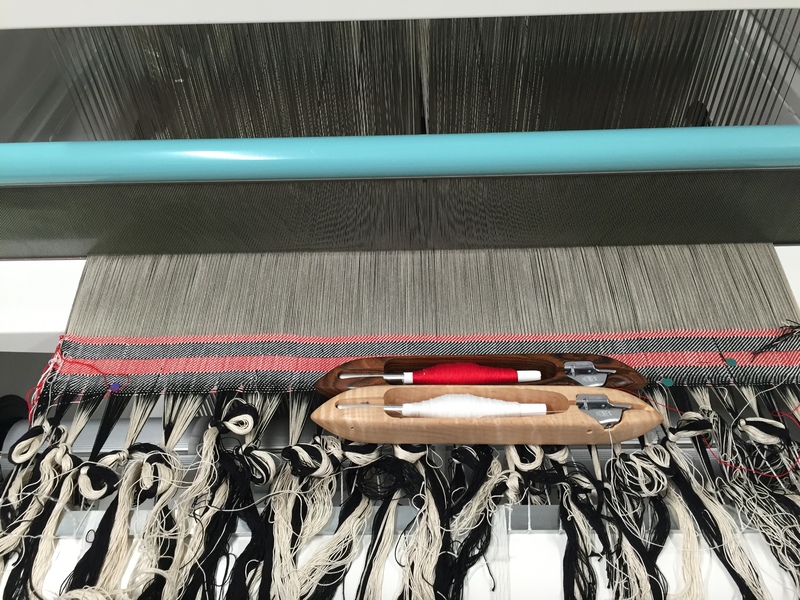 Because the full warp is very dense, I’m debugging using a double weave draft – two layers of 2/2 twill. It’s a striped draft, exchanging layers every inch or so. That lets me debug each layer separately. I’ve only found one threading/sleying mistake so far. Considering how difficult it was to thread, that is astonishing accuracy. Very happy about that. I’ve found quite a few sticky heddles, though – mostly, heddles that get stuck in the “up” position. I’ve been following Cathryn Amidei’s advice and gently tugging downward on those heddles to help them down. After being manually lowered several times, they’ve started behaving properly. The next step is to fix the heddles that get stuck in the “down” position – much more difficult since they aren’t as obvious. I think I may switch to a 1/3 twill design; that should make those stuck heddles easier to find and fix. There are a few things I still need to debug. The two warps have vastly different tensions, which means I need to read through the manual and figure out how to set tension on the warp beams. And I’m not sure whether the auto-advance is turned on. And a few other minor tweaks – nothing complicated or difficult, just getting the feel of the loom. All in all, though, debugging is going very well – so well, in fact, that I expect to finish today or tomorrow. Since I had allocated two weeks for debugging, this means I’d better get hopping on the next steps. The only problem is that I have no idea what they are! I had expected to have six weeks to contemplate the question during chocolate season, but it looks like I’ll need to get cracking sooner. I’m grateful that things are going better than expected, but it is challenging me to think about design. Especially if this hot weather continues, I’ll have a lot more time for weaving than I expected. 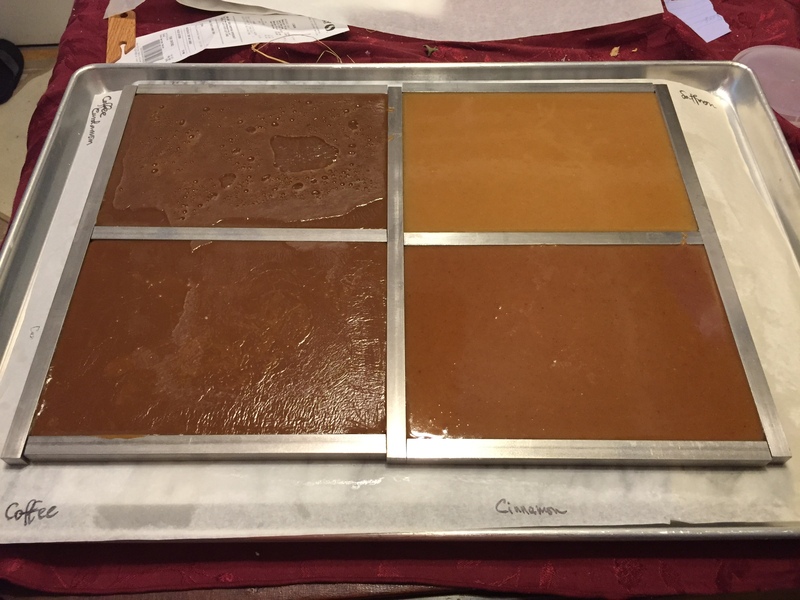 The caramels came out wonderfully, with perfect texture for cutting and dipping. However, the weather was unexpectedly hot – around 80 F rather than 70 – which made chocolate work impossible. My friend Chris (who had come over to help) and I made some valiant efforts, but it was simply too hot to get the chocolate to temper correctly. So, no finished chocolates from this batch. That said, I did get to sample all the centers. Of the six caramel flavors, I liked the rosemary-thyme-honey, coffee, coffee cardamom, and cinnamon honey the best. The rosemary-vanilla was a bust – the rosemary overpowered the vanilla – and I used way too much saffron in the saffron-rose-cardamom caramels. I may try that recipe again, but with about 1/4 the saffron. The jury’s still out on the two ganache flavors (balsamic vinegar/goat cheese/honey and plain goat cheese/honey). They taste good now, but I want to wait a few days to see how the flavor evolves. Since I will likely use only one of the coffee flavors, that gives me three new flavors to put into the boxes. Usually I try for 6-10 new flavors (a box contains 32 flavors plus candied citrus peels), so I’m halfway there. Unfortunately, the hot weather is predicted to continue through next weekend, meaning I probably can’t test chocolates next weekend either. I’m not worried yet, but I hope the weather cools down soon! So back to the loom! I think it’s time for me to spend a day or two studying shaded satins in double weave. I may also start dyeing some weft yarns. Congrats on getting the warp on the loom! I look forward to seeing what you will be weaving in the near future! Thanks, Sheila! I can’t wait to start designing for Amazing Grace. It’s a steep learning curve, but I’m enjoying every minute!